Understand the full spectrum of corporate and social consequences of potential risks, compare them to corporate/social tolerances. Make informed decisions that preserve enterprise value. Set clear priorities for action, resource allocation, and capital investment. Compare risk portfolios to corporate specific and societal risk tolerances, communicate and preserve social license to operate. Riskope identifies, quantifies, prioritizes enterprise risks (ERM) related to life, property, income, or reputation, helping executives and Boards to make informed decisions that preserve enterprise value. This includes a comprehensive review of natural, human hazards and threats. These can be both internal and external to the organization. They can potentially threaten the functional elements of the business and their inter-dependencies. …and thus provides risk based decision making (also known as Risk informed decision making) support for industries, projects and businesses. Riskope provides risk based decision making support for industries, including resource extraction and processing, energy generation and distribution, transportation and logistics, and insurances. The company prioritizes potential risks based on corporate and social risk tolerances (tolerable, acceptable risks) defined for each project, operation, business. Riskope uses the Optimum Risk Estimates (ORE, (C)Oboni Riskope Associates Inc.) convergent, scalable quantitative risk assessment platform to fulfill clients’ needs. World-wide, cross-disciplinary, quantitative, convergent, rational risk assessments and risk based decision making (ERM) for projects, industries, businesses. Additionally Riskope’s approach applies to operations, tactical and strategic risks. This allows for planning at projects’ inception, from pre-feasibility stage and then follow the project’s, business’ development through its life. Thus, Riskope’s approach is scalable. That means no information is wasted, the next level of development feeds on the prior one. 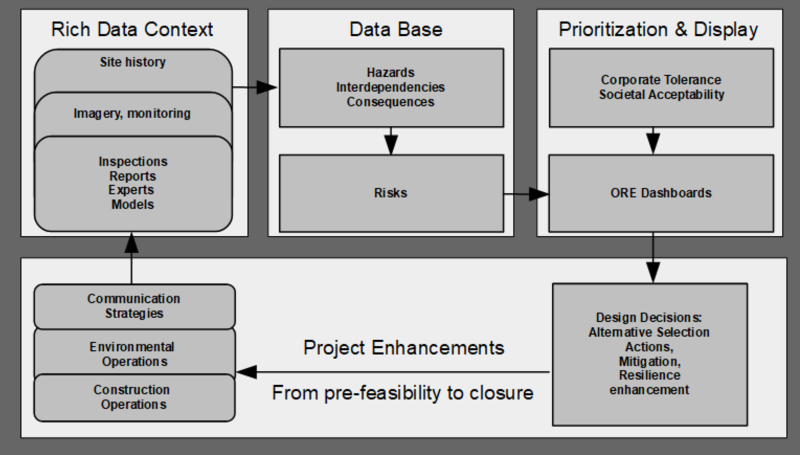 It is also drillable as information can be queried because of the very robust architecture of the hazard and risk registers. First, we identify the adverse events that could impact a client’s business. This includes a comprehensive review of natural and human hazards and threats, both internal and external to the organization. Second, we quantify risk by quantifying the probability that an event will occur and the consequence or impact of the event. This analysis is transparent – we provide all data, facts, and underlying assumptions so that our clients understand the basis of our analyses. Third, we prioritize the risk factors that could impact the business, based on the client’s risk tolerances (tolerable, acceptable risks).